LONDON--(BUSINESS WIRE)--Technavio analysts forecast the global roofing chemicals market to grow at a CAGR of approximately 8% during the period 2018-2022, according to their latest market research report. A major trend being observed in the market is the rising development of bio-based roofing chemicals. With the increasing concerns about toxic effects of synthetic chemical-based roofing products on the environment and humans, the need for developing bio-based and sustainable roofing products is rising at a high rate. Many consumers across the globe are looking for greener, bio-based or natural chemistries to replace petrochemical-based products. With the rising sustainable living standards and growing middle-class population, the need for reducing the carbon footprint of houses has increased. This has fueled the demand for roofing chemicals. Roofing chemicals are highly efficient for the thermal management of buildings. These chemicals provide high reflectivity properties to the roofs, thereby lowering the temperature of the houses. This market research report segments the global roofing chemicals market into the following products (asphalt/bituminous, acrylic resin, epoxy resin, and elastomer) and key regions (the Americas, APAC, and EMEA). It provides an in-depth analysis of the prominent factors influencing the market, including drivers, opportunities, trends, and industry-specific challenges. Of the four major products, the asphalt/bituminous segment held the largest market share in 2017, accounting for nearly 41% of the market. The market share of this segment is expected to increase by almost 1% during the forecast period. APAC dominated the global roofing chemicals market in 2017, accounting for a market share of around 40%. This region is anticipated to post the fastest growth during the forecast period. Save big with Technavio this May! Find out what companies are venturing in to beat the heat this summer! Technavio indulges you with a massive 20% OFF on all non-alcoholic beverages reports for the entire month. Technavio honors the achievements and efforts of Motherhood this Mother's Day by offering a whopping 30% OFF on all cosmetics and toiletry reports. Offer valid from 7th May for a limited period. 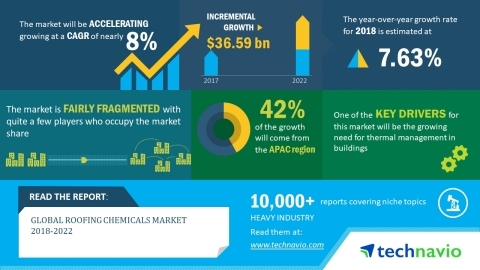 Technavio analysts forecast the global roofing chemicals market to grow at a CAGR of approximately 8% during the period 2018-2022.